As there are no articles in my mother tongue, using them correctly in English is a real challenge. Like many other non-native speakers, I often leave them out or use one too many. And my students do this too. I have been thinking for years how to teach articles effectively and finally I feel that I found the way. 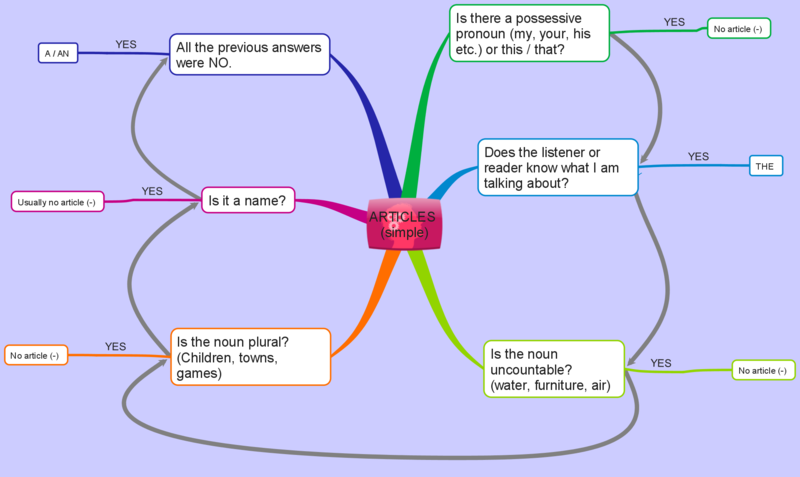 I created a mind map which shows the thinking process you should go through to have the articles correct. There are two mind maps. The first one is simpler and the other is for more advanced students. 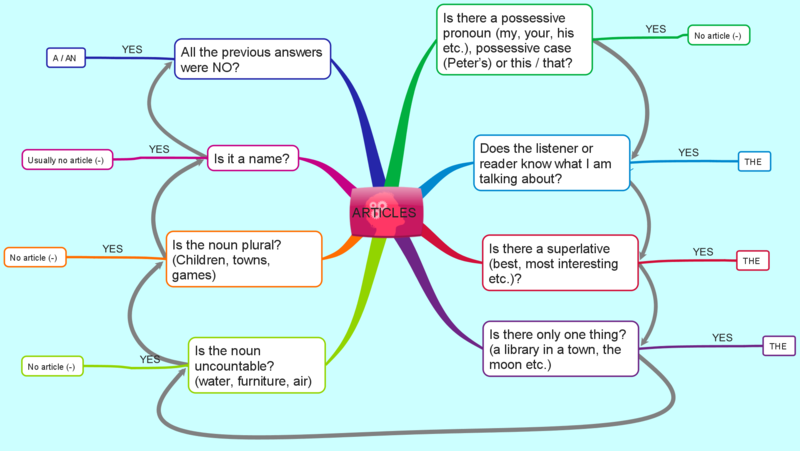 The mind maps show the thinking process you should go through to get the articles correct. Start at 1 o’clock and go clockwise. If you still feel that you need more explanations, you can watch the following video explaining the usage of the definite article “THE”. The recording was prepared by BBC learning English. For those of you who regularly come to our site there are two new games this time. The first one is a classical game called Who Wants to Be a Millionaire?. You have to answer all the questions correctly to win this game. Good luck! Articles – Who Wants to be a Millionaire. The second new game is called Fling the teacher and your task is again to answer all the questions correctly. If you manage to do this you will fire the teacher :-), because you will not need him any more. Articles – Fling the teacher. Sorry about the the mistake. I will try to erase it.